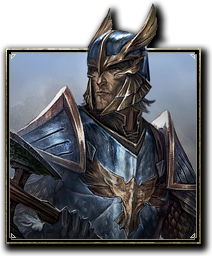 The Altmer, or self-titled "Cultured People", are a tall, golden-skinned race, hailing from Summerset Isle. They are also known as High Elves by the denizens of Tamriel. In the Empire, "High" is often understood to mean proud or snobbish, and as the Altmer generally personify these characteristics, the "lesser races" generally resent them. Altmer live two to three times as long as humans; with a 200-year-old Altmer being old and a 300-year-old Altmer being very, very old. Altmer consider themselves to be the most civilized culture of Tamriel; the common tongue of the continent is based on Altmer speech and writing, and most of the Empire's arts, crafts, laws, and sciences are derived from Altmer traditions. They usually have golden, green, or amber eyes. The Altmer are the most strongly gifted in the arcane arts of all the races, and they are very resistant to diseases. However, they are also somewhat vulnerable to magicka, fire, frost, and shock, which makes them very weak against their strongest point - magic. They are among the longest living and most intelligent races of Tamriel, and they often become powerful magic users due to both their magical affinity and the many years they may devote to their studies. The racial skills of the High Elves reflect their magical affinity by increasing their damage with destructive spells, increasing their rate of regaining magicka, and giving them bonuses to base magicka and experience gain. Highborn 1 ​ Increases your experience gain with the Destruction Staff skill line by 15%. Increases your experience gained by 1%. Spell Recharge 5 When you activate a class ability, you restore 200 Magicka or Stamina, based on whichever is lowest. This effect can occur once every 6 seconds. When you are using an ability with a channel or cast time, you take 1% less damage. 15 When you activate a class ability, you restore 400 Magicka or Stamina, based on whichever is lowest. This effect can occur once every 6 seconds. When you are using an ability with a channel or cast time, you take 2% less damage. 30 When you activate a class ability, you restore 640 Magicka or Stamina, based on whichever is lowest. This effect can occur once every 6 seconds. When you are using an ability with a channel or cast time, you take 5% less damage. Syrabane's Boon 10 Increases your Max Magicka by 600. 20 Increases your Max Magicka by 1200. 40 Increases your Max Magicka by 2000. Elemental Talent 25 Increases your Spell Damage by 86. 35 Increases your Spell Damage by 172. 50 Increases your Spell Damage by 258. This page was last modified on 2 March 2019, at 22:32.